No Samsung Johnny 5 yet though, sadly. You’ve got an 8K TV, you’ve got your own AI smart assistant and connected home system. What’s left for Samsung at CES 2019? Robots, that’s what. Samsung has used the Las Vegas press conference to reveal its first line-up of robots, covering everything from retail solutions to mobility support. There’s the charming Bot Care for at-home medical support, the Bot Air for air quality monitoring and air purifying, the Bot Retail to take on the SoftBank Robotics Pepper in offering support at shopping centres and other consumer-facing locations, and the Gems exoskeleton to help in the support of lower-body mobility and strength. Bot Care: what can it do? 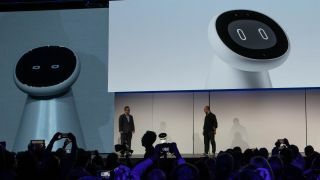 It was the Samsung Bot Care that received the most attention however, being the only one of the devices physically revealed at the Samsung press conference. Demoed onstage, the roll-around Bot Care is a glossy white bot with a screen for a face that can not only display the robot’s ‘emotions’ but also information on an owner’s vital statistics. Taking voice commands and returning information to a user with a voice of its own, the Bot Care can offer exercise and stretching guidance, track medication intake and monitor a user’s sleep too. The Bot Care can also take live readings over a user’s vital statistics too, thanks to a sensor embedded just under the display. Place your finger on it and it can offer a blood pressure reading. If it suits the owner you can also set the Bot Care to send a report to a loved one based on your health monitoring stats – great if you’ve an elderly or poorly loved one that you’d like to check in on remotely. Should the Bot Care notice an emergency, it can call on local emergency services too. There’s no word yet on home or commercial releases for the bots, but if you’d like a sci-fi helper for your home, Samsung will soon be able to deliver that.